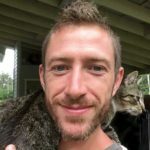 Originally from Libby, Montana, Gabriel Holt has been living in Puna, Hawaiʻi for over a decade practicing organic agriculture and bodywork. Also in his time living and learning on the slopes of Kīlauea, Gabriel has developed the unique style of art that you see here—one profoundly inspired by the dynamic living landscape of Hawaiʻi island. First introduced to the art of “Peyote Stitch” while living here, Gabriel’s explorations of the natural world and meditations on sacred geometry has flowered into the one-of-a-kind pieces found only here at Wild Heartists Gallery in Hilo, Hawaiʻi. My art is expressed through a style of beading I invented about ten years ago. 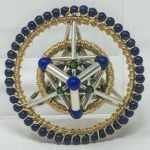 I started by making “flower of life” designs and continued to explore as much about geometry as I could by building 3D models of numerous forms. I came to understand that geometry has its own language, a logic of equilateral triangles that forms the building blocks for other more complex shapes—ones that can express more fundamental and esoteric understandings of the universe. In sacred geometry one of the most noted proportions is the “Golden Ratio” (~1.618), found by dividing the circumference of a circle by its radius. The Golden Ratio is ubiquitous in nature on earth and in the cosmos and is seen by some, therefore, as a sacred pattern that embodies harmony with all of life. It is this proportion I look for and bring out when I make my art. I create these forms as a meditation on this and other ratios, expressed in a plurality of ways within each form.